Bing Ads Intelligence is a powerful keyword research tool that allows customers to build and expand on their keyword lists using the Excel interface. Customers can easily gauge the performance of relevant keywords and apply those insights to improve their keyword selection and campaign performance. Download the Bing Ads Intelligence tool. Apply the keyword suggestion and keyword analysis features. Create customizable keyword research workflows. Download and leverage the integrated keyword research templates. Before you install the Bing Ads Intelligence tool, be sure you have Microsoft Visual Studio Tools for Office and Microsoft Office Excel 2010 or newer installed and closed on your computer. Also, you must uninstall any previous versions of Bing Ads Add-in for Excel, or Bing Ads Intelligence. Next, sign in to your Bing Ads account and navigate to the Tools tab. Click the Bing Ads Intelligence menu item to link to the Bing Ads Intelligence download page. 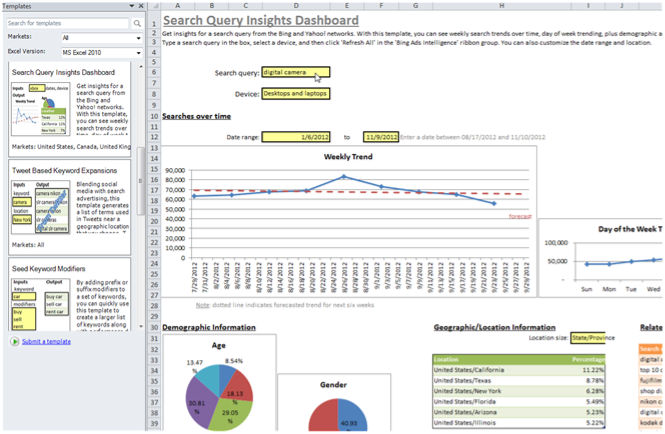 You can also navigate directly to bingads.com/BAI to download the Excel add-on. From here you may select “Download now” and follow the Install Wizard prompts. After you install BAI, all of the options are available on the Bing Ads Intelligence tab on the Excel ribbon. Sign in to your account to use the suggested keywords and bid estimates to improve your keyword selection and campaign performance. Each report appears on its tab in a table that makes it easy to sort, filter, and zero in on the specific information you want. Begin using BAI by selecting and typing the keywords you want to research and clicking a report – for example, one that shows the Bing and Yahoo search containing your keywords. It is a good practice to check out the other reports to see which will be most useful for your campaigns. 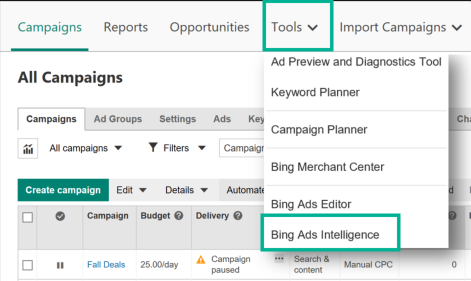 To research keywords that already exist in your Bing Ads accounts, click Select Account, then search for an account, and choose the campaign and ad groups that contain the keywords you want to work from. Like before, select the keywords that you want to research, and choose a report. More Research Options buttons create a keyword strategy based on attributes like historical performance, geography and demographics, as well as review data to optimize keyword bidding strategies. Most of these buttons require the input of parameters to fine-tune results, e.g., match types, bids, devices and date ranges. The Keyword suggestions buttons help you perform integrated research on keyword and bid estimates. You can tailor your bidding strategy based on pricing data for keyword-specific metrics such as clicks, impressions, position, click-through rate and cost per click. To generate a suggested keyword list, select the keywords you want to use from your Account Keywords Worksheet (or any worksheet with a column of keywords). Select keywords from only one column. On the Bing Ads Intelligence tab, click Keyword Suggestions. If you want to customize the list, click Customize and select the options you want in the Keyword Suggestions dialog box and click Submit. After you’ve created your list of suggested keywords, click Create Bulksheet and choose the bids and match types you want, and the campaigns and ad groups to add them to. Then, create a CSV file that you can import directly into Bing Ads. With the Bing Ads Intelligence tool, you can work with keyword lists of up to 200,000 generated words, easily filtering out adult/brand terms from your keyword expansion. Click Traffic for daily, weekly and monthly search query counts. Traffic is useful for spotting trends in search queries. Click Keyword Performance to view historical performance data for the specified keywords, including clicks, impressions and costs. Click Webpage Keywords to generate keywords from a specific website. Click Keyword Expansions and use the Bing keyword research tool to get more ideas from the keywords you select in the sheet. Click Searches with Your Keyword to generate a list of search queries containing your keywords. Click Associated Keywords to generate new keywords based on other advertisers' bidding behavior. Click Related Searches to create a list of search queries based on the Bing Related Search results. The related search terms are derived from the related searches list that appears on the left side of the Bing Search results screen. Click Keyword Categories to view a list of business categories for specified keywords. Click Search-User Location to generate a list of locations within a country, state/province or city with the most searches on specified keywords. Click Age Group & Gender to generate age group and gender percentages for the specified keywords over the last 30 days. Click Bid Estimation for New Keywords to research bid suggestions and estimated performance data for existing keywords. These are pre-generated keyword research ideas in the form of dashboard spreadsheets. Accessing these templates is easy. Click on the Keyword Research Templates button to open the Template panel. Scroll to the desired template and click to open. Most templates contain instructions, but, in general, they are easy to use. You enter information into highlighted cells and click on the Refresh All button. Templates are powerful and flexible. You can extend existing templates with additional Bing Ads Intelligence and Excel features, or create custom templates based on your own unique workflow. Templates can be saved and shared with colleagues, or even shared with the Bing Ads Intelligence user community. To submit custom templates, email bai-templates@microsoft.com. Bing Ads Intelligence lets you choose where to display results in your workbooks. In addition, you can manipulate data with favorite Excel features, like pivot tables, filters, sorts and graphs. Let’s say you want to create a list of Generated Keywords from the seed keyword, “digital camera.” From the Generated Keyword column, select the keywords to return data. Click Traffic to open the dialog box. Choose Existing Worksheet, and select the cell where the returned traffic data should be placed. In this example, we chose D6. Click Submit, and the Traffic data is inserted at the cell location selected, D6. You can save this workflow and use it again later. If you need traffic data for a different keyword, simply select a new range of keywords and click Refresh All in the ribbon. Watch a video on how to use BAI for keyword research, expansion, pricing, and key performance indicator data. 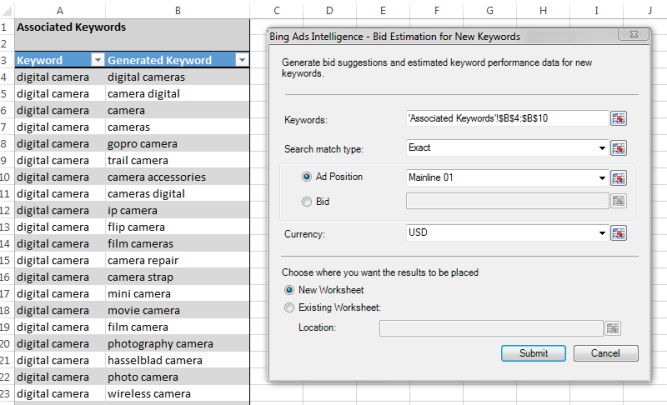 Bing Ads Intelligence is a powerful keyword research tool that helps you build, expand and optimize suggested keyword lists and bid estimates using familiar Excel. Build lists of up to 200,000 generated keyword lists. Create original keyword research templates that let you analyze data for your business. The Bing Ads Intelligence tool is free to download. Thanks for reading this training on the Bing Ads Intelligence Tool. Continue your training or take the BAAP exam to become accredited.